When you think of Chino Hills basketball, you immediately think of the Ball brothers; Lonzo, LiAngelo, and LaMelo – and deservedly so – those teams were great and displayed a fast-paced style of basketball that’s rarely seen at the high school level. The Ball family was considered the reason for all the dominance from Chino Hills by so many people in the United States. However, when you look at Chino Hills, the Ball brothers aren’t the sole reason why this high school has become so dominant. 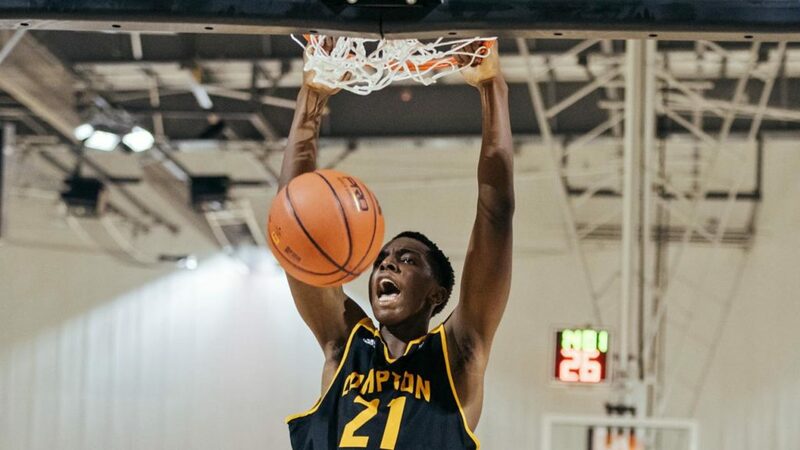 Another major catalyst to why this public basketball institution in southwestern California is so productive annually is due to the performance of the 16th ranked player on ESPN’s Top 60 in the junior class, power forward Onyeka Okongwu. But even before his arrival at Chino Hills, Onyeka and his family experienced a tragedy. Oneyeka’s brother, Nnamdi, who was receiving numerous Division-1 basketball offers, suffered a skateboard accident causing him to suffer a severe head injury. Three days later, Nnamdi died after being put on life support. Prior to his death, Nnamdi told then Chino Hills coach Steve Balk that his younger brother was going to be a better player than him. Okongwu slams it home in during a Chino Hills road game. Photo courtesy of LA Times. Okongwu’s freshman year at Chino Hills was a minor success, even despite the Ball brothers attempting roughly 85-90 percent of the team’s shots. Coming off the bench, he averaged 7.2 points per game. In the state title game, Okongwu helped Chino Hills finish off an undefeated season, contributing seven points, nine rebounds, and five blocks against powerhouse De La Salle High School. After his freshman season, Onyeka began to receive national recognition, even though he failed to average double figures for that past season. Okongwu was invited to play for Team Wiggins at the Adidas Nations camp and was the youngest player in the camp that had over 80 players participating. He averaged six points and 5.8 rebounds per game through four contests. In addition, Okongwu was also invited to the USA Basketball Juniors National Team in October of 2016. The following year at Adidas Nations Camp, Okongwu averaged 8.2 points and 6.2 rebounds per game in five contests, for USA Red 2019/2020, including a 21-point and six rebound effort against USA Blue. During his sophomore season, Okongwu was still a role player alongside Liangelo Ball and LaMelo Ball, however, Okongwu’s scoring numbers increased, averaging 12.2 points per game. Okongwu wound up stringing together five double-doubles in that season, most notably at the Rancho Mirage Holiday Invitation, where he tallied 20 points and 13 rebounds. Although Chino Hills would fail to defend their title, losing to the powerhouse Mater Dei who was led by Oregon commit Bol Bol, Okongwu’s impact started to take form. Okongwu’s junior year had arrived and shocking news broke out as LaMelo Ball was pulled out of Chino Hills. This was beneficial to Okongwu because now he could prove that he can be the man for Chino Hills – and boy has he lived up to those expectations. This season, Okongwu is averaging 28.4 points, 10.3 rebounds, and 3.2 blocks per game. Not to mention, he’s shooting an impressive 73 percent from the field. Okongwu received the opportunity to face Zion Williamson, another fellow high school standout, in the Hoop Hall Classic. Okongwu rose up to the occasion by scoring 35 points and securing 14 rebounds in a victory. As far as his basketball future after high school goes, scouts have found Okongwu to show impressive agility for his size, running the floor swiftly. He crashes the offensive glass relentlessly and has good instincts in the passing lanes. Also, Okongwu has the ability to become a stand-out rim protector with his long wingspan. His offensive game has made major improvements throughout his high school career as well – just look at his averages each year. Okongwu plays with the energy of Draymond Green coupled with the length and agility of Anthony Davis. Only time will tell if he ends up panning out into a star in college, or even later in the NBA. Just recently he announced his top five colleges, which are Arizona State, Kansas, UCLA, USC, and Washington. Wherever he goes, Okongwu will make a major impact with his production on the offensive glass and defensive end. There’s no doubt that Okongwu will play his heart out every minute he’s out there on the court. ← Understanding the Canadian Men’s Soccer Team’s Issues: Can John Herdman Bring Success?